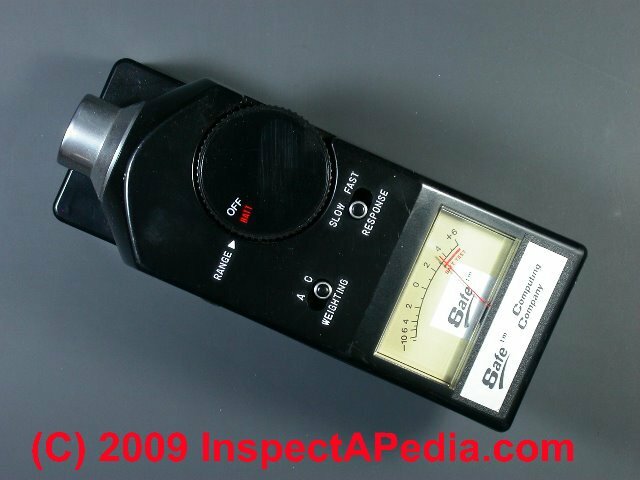 Our page top photo shows a Safeco™ electromagnetic field measuring instrument. This the EMF readings that this instrument obtains are position sensitive - where you point it makes a difference even in the same spot. As we explain at EMF RF FIELD & FREQUENCY DEFINITIONS, there is a wide range of electrical field types when arranged by frequency, from lower frequencies emitted by electrical power lines (EMF), AM and FM radio frequencies (radio towers - MF and HF or VHF), cell phones, FM and TV radio frequencies (UHF) and others in the electromagnetic spectrum.